teach both children and adults using Suzuki Method philosophy and repertoire, and alongside this, I use Alice Kanack's Creative Ability Development (CAD) curriculum for teaching improvisation. For babies and toddlers (ages 0-3 years & 11 months) and their parents, I teach Suzuki Early Childhood Education (music and movement) group classes. For more info or to sign up for the baby & toddler class, please see the Pasadena Suzuki Music Program's website. For children age 3 & up, Suzuki-style lessons include a student (the child) and a Practice Partner (usually the child's guardian) who sign up to attend together as a 2-person team. These child-adult teams attend weekly private lessons and weekly group classes (a twice-a-week commitment). (Adults seeking lessons for themselves may attend alone). A child's Practice Partner or "home coach" is usually a parent, but can also be a grandparent, aunt or uncle, close family friend, nanny, or an older music student hired to be a "music sitter", etc. Practice Partners attend lessons with the child, and do not need any prior musical experience. 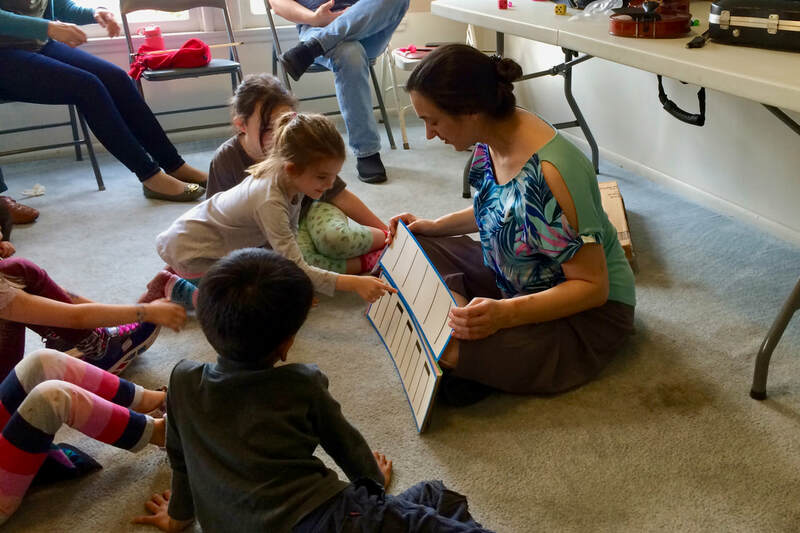 They learn to play the instrument alongside the child at the beginner levels, and provide encouragement, logistical support, and practice reminders at the more advanced levels. The Practice Partner also takes notes, pictures, and makes brief recordings of homework assignments during each lesson. At home, the Practice Partner coaches and encourages the student using these notes, pictures and recordings as a reference, on a daily basis. If you are unable to find a family member or friend to be a loving adult practice partner for your child, it may be possible for me to help you find an older, more advanced student who can be hired as a Practice Partner or "music sitter". Please ask about this if you are interested. If you'd like a head start on a deeper understanding the Suzuki philosophy before your begin lessons, please read Shinichi Suzuki's book Nurtured By Love. If you'd like a head start on understanding the Creative Ability Development (CAD) philosophy which was inspired by Suzuki's ideas and which I use to guide students through improvising & creating their own musical ideas, please read the preface to any of Alice Kanack's Fun Improvisation for... series. My teaching primarily covers how to play the instrument, with a secondary emphasis on reading, writing, and improvising music. and as students become ready, other traditional etudes and supplemental repertoire will be brought in. Inquire about starting lessons by filling out the form at the bottom of this page. I teach with patience, gentleness, and persistence. I have high musical standards, and I challenge my students to go beyond what they think they can do - but I also come alongside them with the needed support for each step. I expect students to practice daily between lessons but I also understand the occasional need to be busy with other life priorities. My goal for each of my students is that they learn: to create music that can make a more beautiful, more healthy, and more expressive place of their heart, mind & body; to share & enjoy this music not only in their home, but with friends and community; and to touch the lives of anyone who hears them play. I teach all levels of viola students - absolute beginners through advancing students (Suzuki Viola volumes 1-9 and beyond). I also teach violin students up through the intermediate level (around the end of Suzuki Violin book 4). I work with all ages in violin or viola lessons, from pre-school age (about 3 or 4 years old) up through adult learners. For babies and toddlers, I recommend the Music and Movement classes as preparation for playing an instrument later in life. The appropriate age for you or your child to begin viola or violin lessons may vary; if you are unsure whether or not your child is developmentally ready to begin formal music instruction, please contact me to set up a time to meet! I teach through the school year (Mid-September through 1st week of June) with breaks for Thanksgiving, Christmas, and Easter. I offer summer lessons when I am in town (summer availability changes from year to year, and is usually between 4-8 weeks of lessons). Currently, I teach group classes on Mondays at Pasadena Suzuki Music Program, individual lessons on Saturdays out of my home in Monrovia, Thursday afternoons/evenings at Bethany Church in Sierra Madre, and Tuesdays and Fridays at St. Margaret's Episcopal School (in San Juan Capistrano, with the SMES After School Suzuki String Academy). Distance lessons (given online via Skype, Facetime, or other video chat software) are an option to supplement in-person lessons for older students who are temporarily out of town, or who have an irregular schedule and cannot attend in-person lessons every week. To get an idea of when you might schedule a lesson, you can take a look at my studio hours and calendar. The calendar is updated often and is the quickest way of finding out whether or not I might have an opening during my normal teaching hours at a time that works for you.